In the past few years, the charter market of luxury yachts not only has grown considerably but it has also been very dynamic. 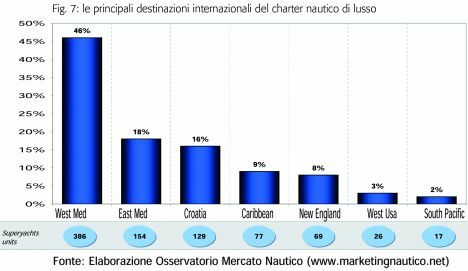 As a matter of fact over the last five years, according to an estimate of the Observatory of the Nautical Market (Osservatorio del Mercato Nautico (www.marketingnautico.net)) the demand for deluxe charters (of yachts longer than 24 meter) increased by 8%. When analyzing such dynamic evolution it is very important to specify that the demand increase is linked to the substantial improvement of the supply both in terms of quantity - the number of superyachts entered in the charter circuit increased - as well as in terms of quality - the services offered by charter companies improved considerably. On the sides of the more traditional brokerage and charter lines, there are new business lines such as yacht management, assistance in the construction of new superyachts and deluxe cruises, which significantly contribute to the business growth of the whole sector. By analyzing the business growth of deluxe charter companies, it is important to point out on one hand the growing internationalization of the operators and on the other hand the greater integration upstream as shown by the widespread strategical partnership with the main superyacht yards. As a matter of fact and not fortuitously, big marine holding companies bought the vast majority of luxury mega-yacht charter companies because they represent an important and profitable distribution channel of products and services - take Fraser Yachts, for example, part of the Azimut-Benetti group or Camper & Nicholsons Intl which recently became part of the Rodriguez Group. An additional factor, which in the past few years contributed to the growth of the charter sector, is the existence of new business opportunities linked to a greater differentiation in the supply of the elite boating tourism world, in particular, "corporate charter" and "megayacht cruises" the demand of which have recently registered a striking increase. In this dynamic and continually evolving context, special emphasis must be given to custom deluxe cruises which have become a highly "attracting" business not only for the companies operating with deluxe charters but also for bigger companies operating in the cruise market. Therefore it is not by chance that in the near future the production of megayachts solely destined to charter may be an interesting alternative opportunity for big yards. Independently of the aspects treated so far, charter demand is to be analyzed even at the light of another very important function it fulfills in the development of the boating sector: it serves as an anticipation to purchase. In fact, it allows the client not only to get to know a specific product/brand but also to become more familiar with the yachting world - a fundamentally important aspect and crucial prerequisite for purchase. Another element in the analysis of the market demand is connected to the optimization of management costs. Today, the Owner who buys a superyacht generally decides to charter his boat for a given period during the year so that the charter revenue compensates for the yacht's managing costs. 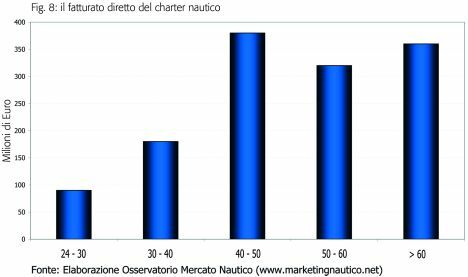 According to a survey carried out by the Observatory of the Nautical Market of Rome Tor Vergata University (www.marketingnautico.net) 16/20 weeks a year of chartering completely meet the operational costs of the superyacht. For example, a 35-meter long yacht that cost ?10 million yields ?80,000 per week; a 50-meter long vessel worth ?24 million can be chartered for ?170,000 a week and, higher up in the range, yachts costing ?70 million and over may be chartered for ?500,000-600,000 per week. These last considerations clearly demonstrate how the yachting charter business is highly attractive not only for the chartering companies specialized in this type of innovative tourism, but also for Owners who use it to cover the managing expenses of their yachts. Figure 1 shows the incidence of chartering in the world fleet of deluxe superyacht. 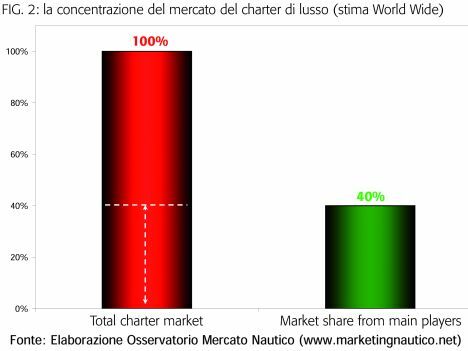 In particular, it is estimated that last year 35% of the fleet of yachts longer than 24 meters was owned by chartering companies and this datum further confirms the prospective potentialities of the deluxe charter market on the international boating panorama. Figure 2, instead, reveals the concentration degree of the international deluxe charter market. It is estimated that 40% of the world market is in the hands of the so-called "big providers" which, as described above, operate on a world scale with a well- structured network. 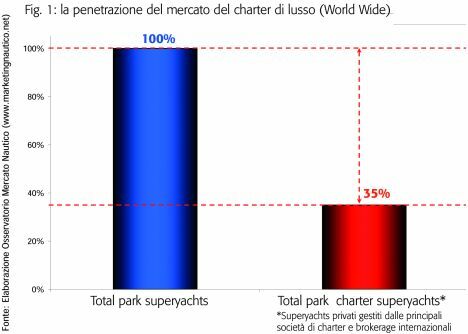 In other terms, 30 to 40 meter long superyachts destined to chartering represent 39.4% of the whole chartering fleet. Figure 4 shows the details of each group. 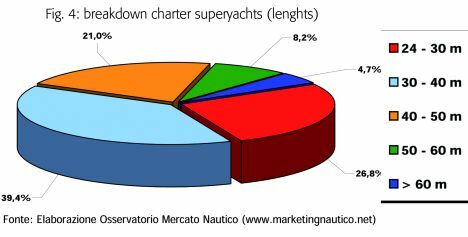 It is important to point out that over recent years the number of superyachts measuring more than 50 meters in length destined to the deluxe charter market increased. 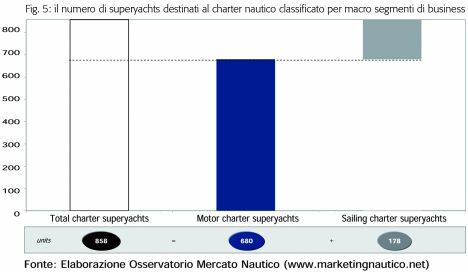 We talked about charter potentialities but we still must deal with the difference between motoryacht charter and sailing yacht charter (see figure 5). It is estimated that the deluxe motoryacht charter fleet includes approximately 680 units versus the 178 units of the deluxe sailing yachts charter fleet. These data reflect the composition of the world fleet of superyachts. In figure 6, the chartering fleet is subdivided into the different business macro segments. 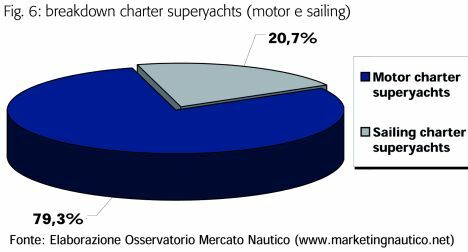 As described above, almost 80% of the chartering market, the main business segment, is represented by motor superyachts. 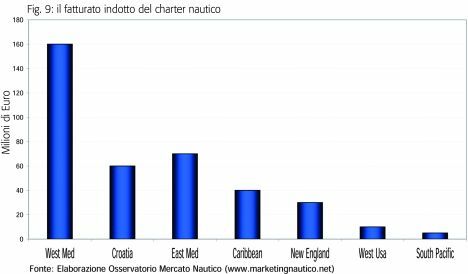 When analyzing the international chartering market the destinations of the so-called "charter Owners" are equally significant (see figure 7). This datum is important because the charter company has to take into consideration the ideal geographical areas in the different seasons of the year for adequately managing its charter fleet. It is clear that the main destination is the west Mediterranean with a 46% share of the whole market, while the Mediterranean Sea (east and west) represent 64%. Other important destinations are Croatia, which increased considerably over recent years, and the Caribbean respectively with a 9% and an 8% share. The last point of the analysis refers to the turnover generated by the deluxe boat charter. Direct turnover - the purchase of the yacht - should be differentiated from the indirect one - generated by allied services (see figures 8 and 9). In particular, figure 8 shows the direct turnover classified according to boat length - because length is a differentiating factor - while figure 9 shows the indirect turnover generated by charters according to the different geographical areas. In conclusion, the deluxe boat charter market is evolving, marked by a growing demand and by a changing supply as regards the range of interconnected services as well as the managerial approach. Which is the future trend of the charter market? 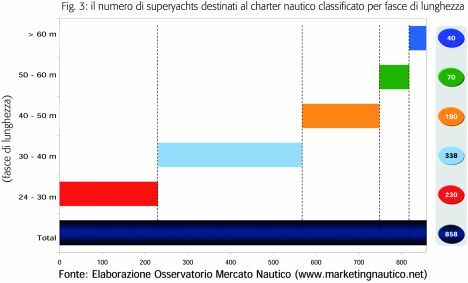 According to a survey carried out by the Observatory of the Nautical Market of Rome Tor Vergata University the number of superyachts destined to charter will increase by 15% in the next three years on the international level. Moreover, it is estimated that charter demand will exceed the purchase of deluxe superyachts.